Yesterday I shared a bit about how my fingers are sore from sewing. And sewing. And Sewing. Well I’m happy to report I worked my thumbs – double-time – and now the pillow factory is officially closed. My point – and I do have one – is this: There’s always another job, another task on the never-ending to-do list of home repair. Fortunately, I’m handy and can tackle a lot of what needs doing. And I’m not even talking about the jobs I can’t do. Things involving electricity and roof patching, or bats in the belfry, for instance. Those jobs require outside help. And saving my shekels to pay for the help. Although I’ve gotta tell ya – I am considering learning how to frame a wall so that I can build a closet. I’m not kidding. I think I can do it! And – how cool is it that I get to try! Well – once the feeling returns to my fingers and thumbs, that is. 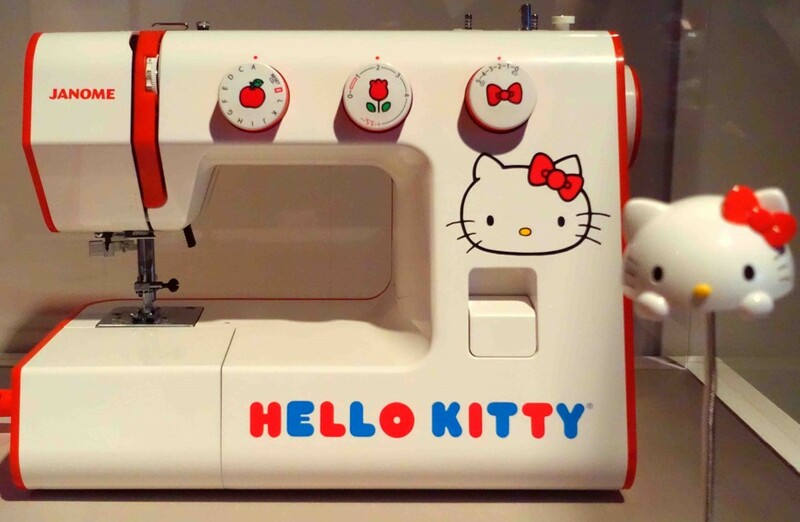 Thank the lord I’m not a seamstress. One of the projects I’ve been working on recently is new cases for all our throw pillows. In the rumpus room, this isn’t an issue, but in the living room, well, that’s another story. You see I kind of view the rumpus room as Mister’s domain. Sure – the space bears my influence, but it’s a rather masculine room and I am super-duper okay with that. But I am striving to make the living room a bit more, well, me. I don’t go in for frills and such, but I do long for a southern living space that feels akin to my soul and my aesthetics. And that means throw pillows, y’all. For better or worse. Actually, it’s pretty awesome that Mister and I get to have separate space, when we want it. And for me, it’s a good thing, as Mister is definitely not a fan of throw pillows. 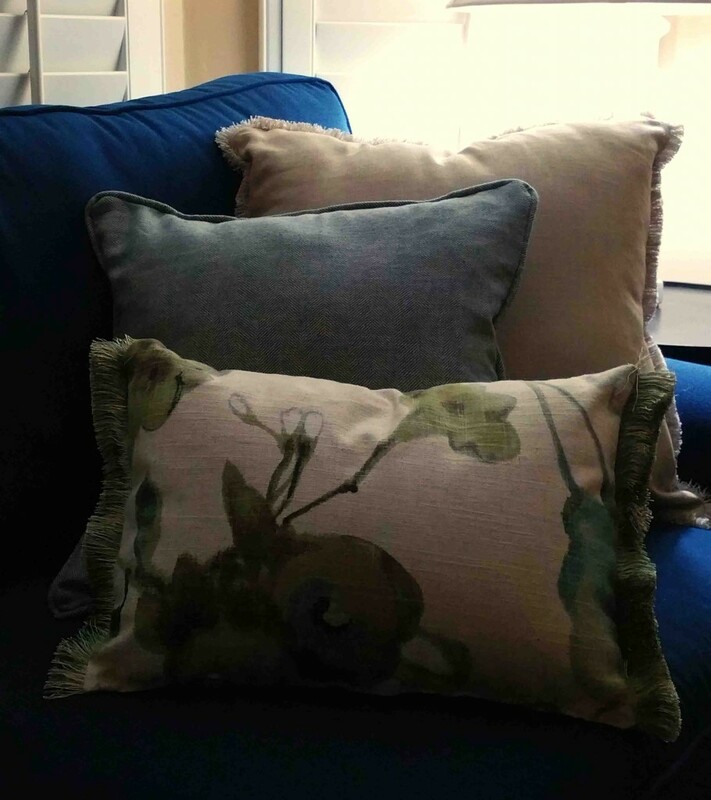 Anyhoo – I’ve done as much as I can with the sewing machine, and am now closing up the pillows by hand. I’ve stabbed myself and numbed my fingers more than I can convey. And it ain’t pretty. But I think the pillows will be, so it’s a fair trade, right? I suppose I’ll have to make that call in a few weeks, once my poor, poor fingers have recovered. 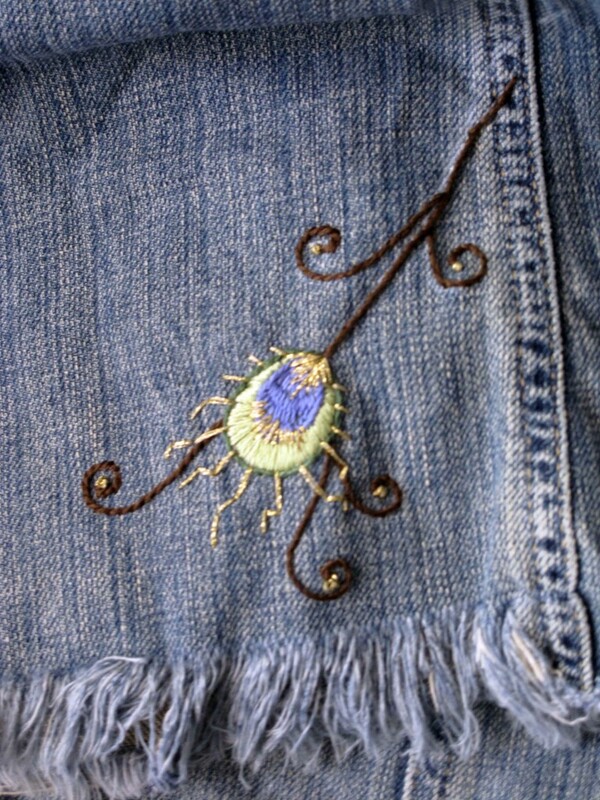 Remember the jeans shown above? I blogged about them quite a while ago. They were an art project and I felt quite a few feelings about them. Basically, I loved those jeans. Truly. But y’all – life happens. After a while, I decided I didn’t particularly love wearing the jeans. Still loved the art, but not the pants. As I felt the aforementioned feelings, I was having a hard time parting with the art-ed up britches. So what was I to do? 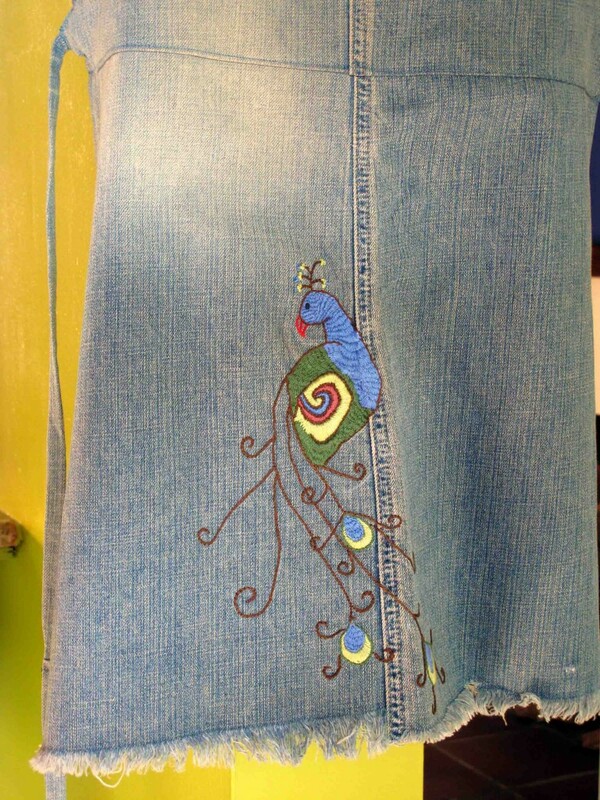 After listening to my dilemma, a buddy suggested I turn the old jeans into an apron. As it happens, I wear aprons all the danged time while cooking. So my buddy’s idea was not only good for my emotional side, it was also good for my practical side. An apron! Brilliant! 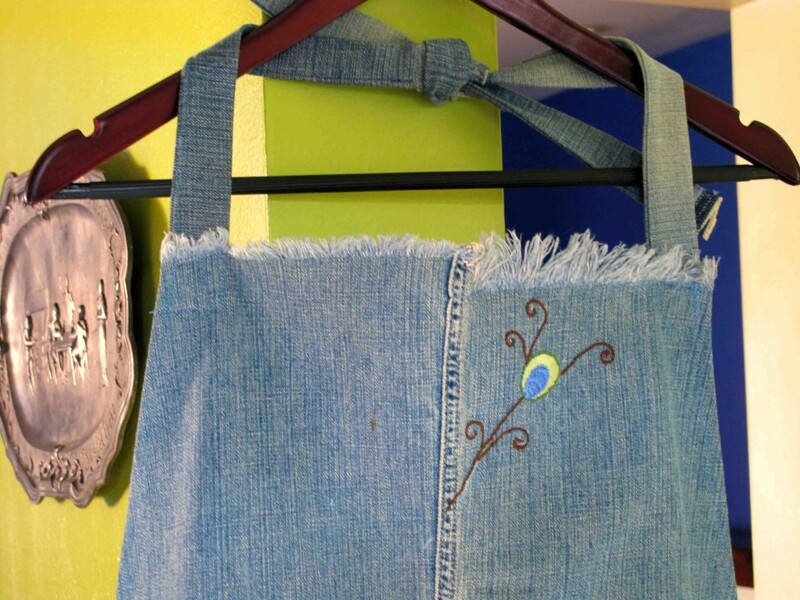 So that’s just what I did – turned those jeans into a new-to-me apron. And can I tell you something? That up-cycled art looks great on my apron hook in my green kitchen. I still have feelings about this embroidery. And now I love this apron. Truly. I went digging in a cupboard a few days ago, looking for thread. Boy, did I find some. 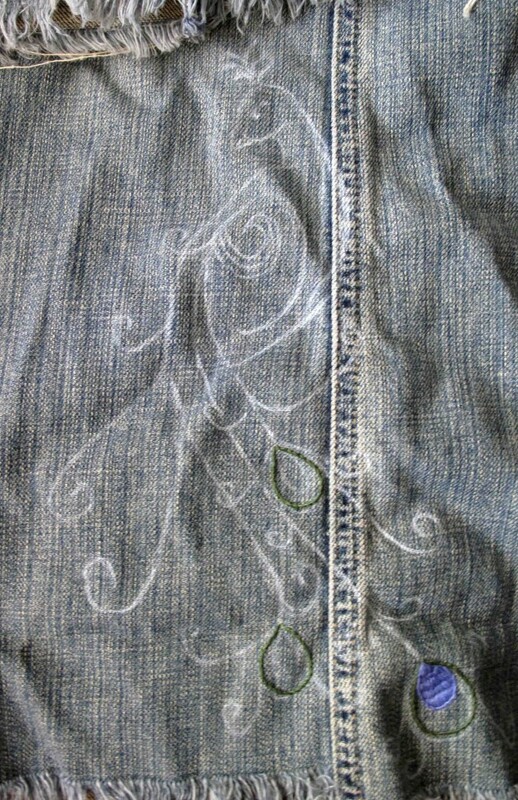 Late last year, I had started embroidering an old pair of jeans. You know, giving them some spit and a promise. Perking them up. As is my wont, I spread my projects out all over the flippin’ place. 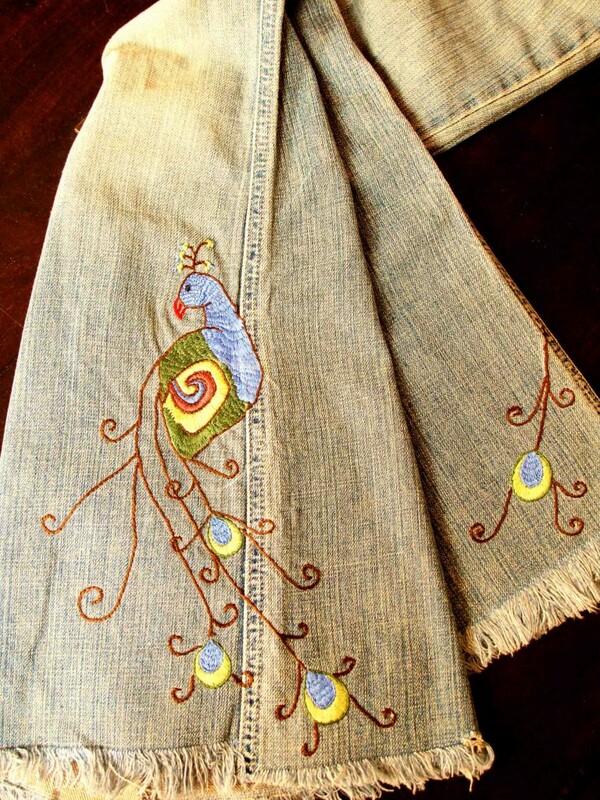 That pair of jeans – along with my embroidery threads and tools – took over the dining room table. Since I’m slow, my sewing project became a fixture of the table. At some point, I was expecting company and leaving the jeans on the table seemed, shall we say, déclassé. So I bagged up my threads, my template and my jeans and stored them in a cupboard. My plan was to resume sewing, right after my guests left. And right after my guests left, I promptly forgot all about those jeans. In fact, a couple of months ago I was looking for those very pants. When I couldn’t find them in my closet, I assumed I had donated them to goodwill. I am, at times, a major dork. So now I’ve found the jeans I’d lost. And I’m back in embroidery mode. I’ll do my very best to actually finish this project. And I’ll also try hard to keep everything tidy in the process. But hey, I didn’t just meet me. So I’m not making any promises here.